ST. PETERSBURG — Driftwood is an old Florida neighborhood snuggled against Big Bayou, a boggy inlet of Tampa Bay. Beyond a tinsel arch stretched over Driftwood Road, the small community is overgrown with virgin oaks and indigenous plants. The neighborhood is home to the popular Oakdale Christmas house and to a new 7,000-square-foot community garden. The garden sits behind the Christmas house on Oakdale Street South and is a joint-venture effort between Emmanuel Roux, owner of St. Petersburg’s The Garden restaurant, and property owner James Tiffee, a retired Navy veteran of 34 years. Roux, who has lived in Driftwood for 16 years, said he would like to build an outdoor bread oven in the garden. He wants to share fresh homemade bread with neighbors. He bakes all his own bread for customers at The Garden restaurant. “It could be a place where it is fun, and fresh homemade bread is the best thing,” Roux said. Roux has planted pole beans, cabbage, broccoli raab, English peas, arugula, Swiss chard, lemon cucumber and basil. He hopes to grow enough basil to supply his restaurant. “It’s ridiculous to buy basil at $8 a pound that is coming from Columbia, Ecuador or South America when we have perfectly good land where we can grow it here,” Roux said. Roux started a compost pile for the garden in July from 20 cubic yards of horse manure, tree clippings and wood chips. He also adds vegetable peels from the restaurant. The rich compost is mixed in with the sandy soil for fertilizer. Large barrels collect rain water and pipes feed the water from the barrels to the garden. The irrigation system will distribute 800 gallons of rain and well water to the garden. Roux said he and a few neighbors approached Tiffee about the community garden in September. Tiffee purchased the 1920s vintage, wood-frame home when he was in the Navy. When he retired and came home, he realized the house was beyond repair. Tiffee said a small garage was salvaged and is now used for a shed to store garden supplies and tools. Community garden members L. “Lucky” Guerra and his wife, Cindy Guerra, are long-time friends of Roux. “He (Roux) and I have sat down for years and talked about a garden, and he’s the one who said, ‘let’s do it,’” Lucky said. The American Community Gardening Association in Columbus, Ohio reports there are 20,000 community gardens in the U.S. and Canada. The nonprofit Association promotes community gardening efforts in urban and rural communities. 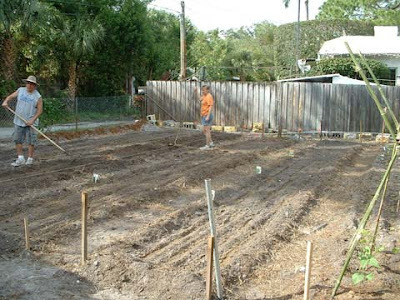 In 2009, the city of St. Petersburg imposed an ordinance for community gardens. Permits expire Sept. 30 of each year. An application for renewal must be filed 30 days in advance. The applicant must notify all property owners within 200 feet of the application. The city retains the right to deny the permit.